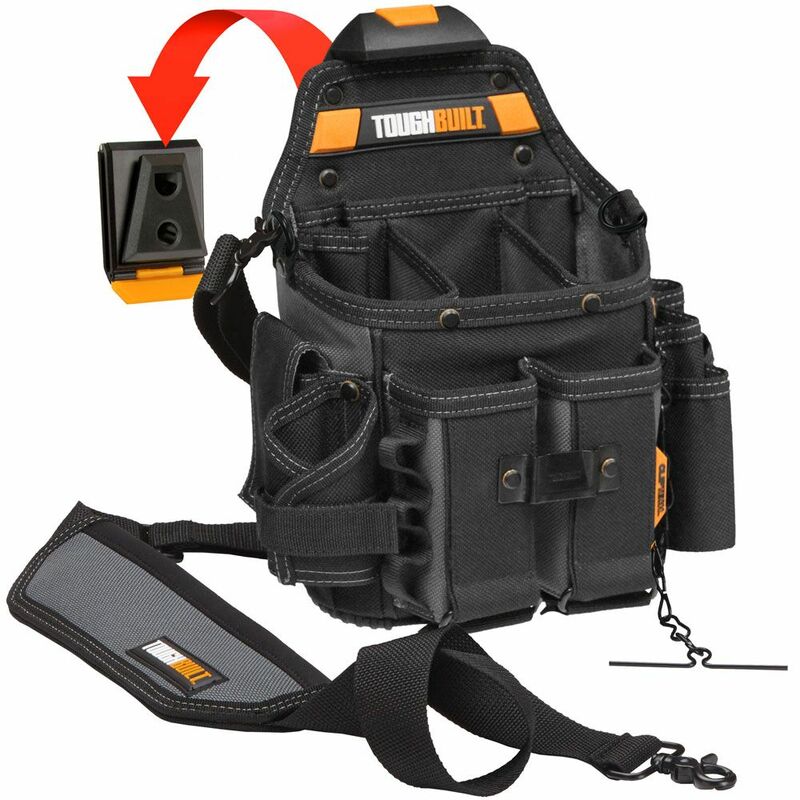 The ToughBuilt Journeyman Electrician Pouch + Shoulder Strap transforms how professional electricians carry their tools. The patented ClipTech Hub allows the pouch to clip on and off any belt, hang from its shoulder strap, or kickstand on the ground close at hand. This pouch is designed for the ever-changing needs of the professional electrician. Made specifically for an electrician's tools, its 21 pockets and loops include a wire-tester pocket, custom-fit flashlight wrap, 2 adjustable tool pockets, notebook pocket, tape chain, and 7 screwdriver loops. With rugged 6-Layer Construction and heavy-duty rivet reinforcement, this reliable pouch withstands the most rigorous working conditions. The DeWALT USB Charging Tool Backpack features a USB charging battery dock that simultaneously charges 2 devices via USB ports. There are 3 Internal charging wall pockets that can hold a tablet, phone, and/or camera and can charge 2 devices through a USB connection to a 20V MAX Lithium battery pack. It features multiple interior panels to hold a multitude of tools and accessories like drills, extension cords, pliers, screwdrivers, wrench sets, drill bits, testers and much more. The 31 Multi-use pockets inside and 2 outside help organize a wide variety of hand tools. There are padded web carrying handles and adjustable shoulder straps to make carrying more comfortable, and convenient. The large pads on the back allow for extra comfort which makes carrying heavier loads more comfortable on stress areas of the back. There is an easy double-pull, heavy-duty zipper and base pad feet which helps reduce wear and abrasion. This softside tool carrier is like owning a workshop to go. With a padded reinforced web carrying handles and shoulder straps, you and your tools can go to the job in one trip. And as far as durability, its anything but soft: heavy duty stitching and bar tacking at all stress points means its built to last. Journeyman Electrician Pouch + Shoulder Strap The ToughBuilt Journeyman Electrician Pouch + Shoulder Strap transforms how professional electricians carry their tools. The patented ClipTech Hub allows the pouch to clip on and off any belt, hang from its shoulder strap, or kickstand on the ground close at hand. This pouch is designed for the ever-changing needs of the professional electrician. Made specifically for an electrician's tools, its 21 pockets and loops include a wire-tester pocket, custom-fit flashlight wrap, 2 adjustable tool pockets, notebook pocket, tape chain, and 7 screwdriver loops. With rugged 6-Layer Construction and heavy-duty rivet reinforcement, this reliable pouch withstands the most rigorous working conditions. Journeyman Electrician Pouch + Shoulder Strap is rated 4.5 out of 5 by 72. Rated 5 out of 5 by Amy from I'm a Tel/Data techbician and this pouch allows me to carry everything I need. It's rugged and du... I'm a Tel/Data techbician and this pouch allows me to carry everything I need. It's rugged and durable. Great product! Rated 5 out of 5 by Lee from Handy to use, easy to take off, tools stay in... Handy to use, easy to take off, tools stay in place. Rated 5 out of 5 by PJ from Perfect size for an install tech! Perfect size for an install tech! Rated 5 out of 5 by Pedro from I was very impressed and satisfied with the speedy shipping... I was very impressed and satisfied with the speedy shipping and no hassle pick up. Instructions were clear and easy to understand. Rated 5 out of 5 by SKelly from Very well designed and nice to use. I was sick of carrying 40-50 lbs. Of hand tools around all th... Very well designed and nice to use. I was sick of carrying 40-50 lbs. Of hand tools around all the time. This has worked great for me so far. If my opinion changes I'll let ya know. Rated 5 out of 5 by braden70605 from Best tool belt on the market! I've been using this for about 3 months now and as an electrician I can say this is by far the best the best tool bag/pouch on the market...very versatile and the quick release comes in clutch with getting up and down on the ground our getting up the stairs into an attic. Now if you load it up... It can get pretty heavy on your hip. But the shoulder strap comes in clutch when you got it loaded up. But if you just put the base needs of the type of job you're on its perfect! Highly recommend. Looking forward to getting more of their products! Just wish they were IN STORE SO I WOULDN'T HAVE TO WAIT ON IT TO COME IN!!! Rated 5 out of 5 by Kira from Practical features! Got this for my boyfriend and the feature he loves the most is the quick release that allows you to remove the pouch from your belt instantly. Also the fact that it stands upright once you’ve removed it, so it can sit on the floor next to you. Very practical and easy to use.